Curiosity keeps leading us down new paths, it's a fundamental aspect of our spirit. Our curiosity sparks imagination and from there we create our world. As Mae Jemison said, "Don't let anyone rob you of your imagination, your creativity, or your curiosity. It's your place in the world; it's your life. Go on and do all you can with it, and make it the life you want to live." 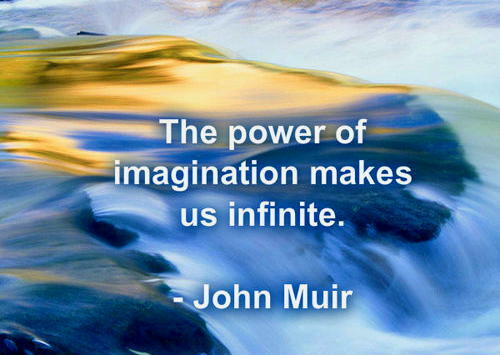 John Robson says: "Our imagination gives us the opportunity to 'try on' new qualities and perspectives in our life. Through imagination, we can explore our past, problems, patterns, processes, plans, perceptions, principles, passions and purpose to uncover new possibilities. Without imagination, we stay stuck in the realm of the material, the past, the superficial and the literal. We remain one-tracked, instinctual and one-dimensional. Only through our imagination can we become multidimensional, experience more love, create more beauty, manifest more results, change our conditions, rewrite the past, and connect with divinity, purpose and other people." As Henry David Thoreau said, "The world is but a canvas to the imagination." Napoleon Hill said, "All the breaks you need in life wait within your imagination, imagination is the workshop of your mind, capable of turning mind energy into accomplishment and wealth." Einstein also said, "Logic will get you from A to B. Imagination will take you everywhere." And Stephen Covey: "Every human has four endowments - self-awareness, conscience, independent will and creative imagination. These give us the ultimate human freedom... the power to choose, to respond, to change."